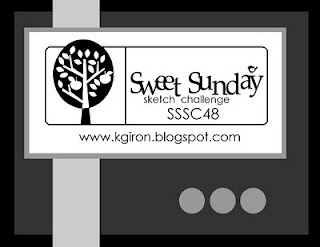 I am literally just squeaking in with my card for this week's Sweet Sunday Sketch. It's due by 10pm mountain, which means 8pm here.... And it's 7:50, hehe. But I loved the sketch this week and always love the chance to feature a sentiment as the main image. So, I'm going to slap this up as quickly as I can, hehe. I used a color combo that I spotted over on Nichole Heady's blog. See her original card here. I thought it was a great combo and vowed I would give it a try in the near future. I pulled out my Turning a New Leaf set to create my own background, a little bit of dp, and some fun punches, ribbon, and buttons. Voila! I think I'm liking this color combo. I'm definitely going to play around with it some more. And I love this little sentiment. Wouldn't it just make the greatest get well card, or even a sympathy card... Or for that matter, just an everyday card? Lovely DP and a great card!! I finally got that Apron Lace punch but have to wait till Christmas (unless I do another unwrapping and re-wrapping like I did with a MS punch I'm getting LOL!) Great colour combo too. I'm jealous of your quiet evening with the house all to yourself and a good book! Oh what I would give for that right now. Had seven very bouncy kids after school today and my two are finally tucked into bed after jammie day at school today and waaay too much junk food at their classroom parties LOL! Enjoy your jammie day tomorrow - just one more sleep :D Oh, and congrats on making Dawn's top picks for her colour challenge!! love the colours and the wrapped ribbon!! I haven't used this set much yet...just for some cards that a coworker asked me to make...I think I will love it...still need to crack the dp open too! Your pj day sounds so fun!! I don't have my kids much either today..whole school doing a movie in the gym while teachers clean up the classrooms and then they have PE with another teacher. Then it's library and board game afternoon!! The weather has warmed up to 3 degrees Celsius!! I like it!! I should get my computer back today so I can make Mercy's sketch this week...it may turn into the dh's Christmas card!! Have a fun day!!! Yahooooooo!!! Super cute Kristina!! Don't you just love that stamp set? I am just getting mine broken in a little!!! So fun, Kristina! I love the green and black combo!